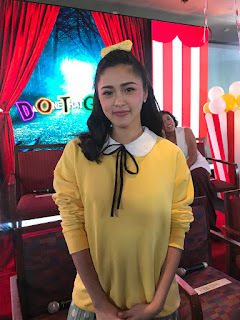 KIM CHIU is celebrating her 28th birthday on April 19 and her new movie, “DOTGA, Da One That Ghost Away”, is opening on April 18 so it maybe considered as her special birthday presentation to her fans. Of course, her birthday wish is for DOTGA to be a big box office hit. This is her second movie in a row with the word “ghost” in the title. The first one was “The Ghost Bride”. The members of Kim’s team include Ryan Bang as Gege Xian, a Korean border in their house; Pepe Herrera as Bagang, their Fact Boy researcher ala-Kuya Kim; Moi Bien as the hugot girl and emoterang frog called Basha; comedian Lassy Marquez as Kim’s kabarkada; Maymay Entrata as Kim’s cousin and Edward Barber as their nerdy neighbor. Also in the cast are Odette Khan as Kanturcia, the friend of Marissa Delgado who holds a deep dark secret; Melai Cantiveros in a special role and Chokoleit, Matet de Leon and Cai Cortez as the evil ghosts who terrorize Kim and her barkada. This is under the direction of Tony Y. Reyes who says he didn’t have a hard time directing the big cast.